Southeast Asia is a cook’s paradise, and an eater’s as well. The food is truly art: tastes mingle with subtle complexity, and presentation is spectacular. The region stretches east from India and Bangladesh to the southern border of China, encompassing the mainland countries of Burma, Thailand, Cambodia, Laos, Vietnam, and the island countries of Indonesia, Malaysia, and the Philippines. Each country has its history cooked into its dishes. For example, in Indonesia and Malaysia the prevalence of Islam has virtually eliminated pork from the diet; Vietnamese food retains the flavors of centuries of French occupation; and Filipino food enhances a local palate with Spanish and American accents. While the countries maintain distinct identities, they also have a great deal in common, and their cuisines share histories as well as many staple ingredients and methods of cooking. The food of any region is not only the result of what ground and climate will produce, but also of who has been there, what powers have influenced it, how poor or wealthy the people are, and what its sensibilities prefer. 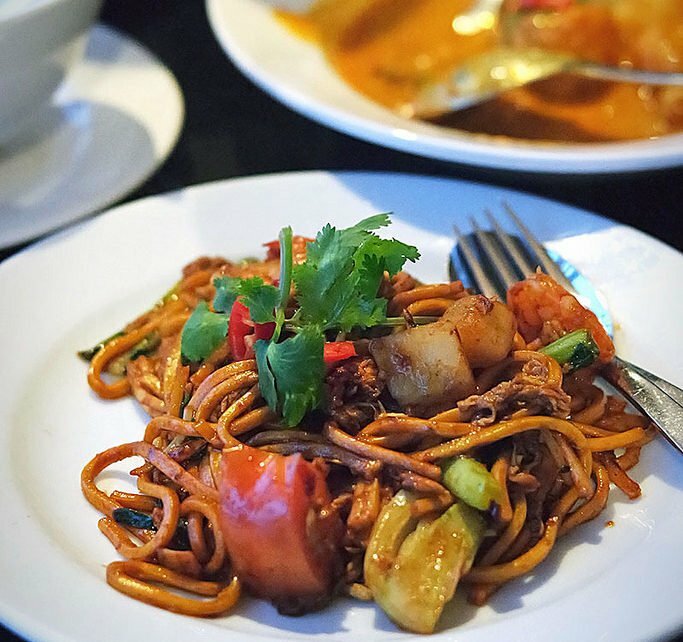 The major influences on Southeast Asian cuisines have been exerted by China from the east (the wok, noodles) and India (curries) from the west. Perhaps the most profound impact on the region’s cooking was made in the 16th century, when the Portuguese brought the chile from the Americas. Today the fiery chile provides signature heat in a Southeast Asian meal. A standard Southeast Asian meal has no courses. All the parts of a meal are presented at once and eaten together. As in Chinese cuisine, the cook (who is, in most homes, a woman) strives for a harmonious balance of textures, temperatures and flavors: sweet, sour, salty, bitter. In Thailand, people eat with a spoon, knife, and fork; in Indonesia, Malaysia, and Singapore, people eat with their (right) hands, and spoons are used for serving. Vietnam is unique in the region for eating with chopsticks. Except in the Philippines and Singapore, desserts, as they are known in the West, are rare. Meals are followed, perhaps, by fresh fruit; heavy, sweet foods are not served at mealtimes except on special occasions. A Southeast Asian kitchen is built around five main items: a coal or wood fire, a wok, a mortar and pestle, a cleaver, and something in which to cook rice — these days it is usually an electric rice steamer. Southeast Asian food is cooked primarily in a well-seasoned wok, an all-purpose pan in which you can stir-fry, deep-fry, pan-fry, boil, blanche, and even steam foods. Some foods, like satay, are grilled directly over the fire, but, because of the scarcity of fuel, virtually nothing is baked. In wok cooking, food is usually cut into uniform small pieces in order to speed cooking time, save precious fuel, and expose the maximum surface area to sauces and marinades. Communal cooking is another method of fuel conservation. Mortars and pestles are used to create the many marinades and spice mixtures. These vary in form from area to area. Thai cooks, for example, use deep, bowl-shaped mortars, while Indonesians use flat mortars or grinding stones, crushing and blending ingredients with a rolling, rather than a pounding, motion. The work of grinding chiles and other spices into powder or paste with mortar and pestle can be replicated by a food processor or coffee grinder, but nothing can match the satisfaction of using your muscles to release and blend multiple flavors into one new, sublime taste and smell. Indonesia consists of some 13,000 islands which stretch from west to east along the equator, from the island of Sumatra, directly south of Thailand, to Irian Jaya, just north of Australia. These islands support the fourth-most populous nation in the world, a population that is 90% Muslim, with hundreds of tribes, subcultures, and languages — and many long and varied histories. For centuries, these islands have been the center of international trade. Rich, volcanic soil produces an amazing number of fruits and vegetables, the seas yield vast numbers of fish. Spices, however, have been the main source of Indonesia’s fame. Nutmeg, clove, and pepper drew traders from India, China, Africa, and the Arab world, and later, European explorers and colonists from the Netherlands, Portugal, and England. From the 8th through the 16th centuries, powerful polities on Java and Sumatra controlled much of what is today the Indonesian Archipelago. But, by the end of the 16th century, steady European colonial expansion left the nation a collection of weak, disconnected fiefdoms, all of which came under direct Dutch control within two centuries. The Republic of Indonesia was declared at the end of the Japanese occupation of Indonesia during World War two. Indonesian cuisine reflects this complex cultural history. Cooking varies greatly by region and combines many different influences. However, most Indonesian food shares the nearly universal food trinity of fish, coconut and chile. The main meal in Indonesia is usually served at midday. Food which was cooked in the morning is set out all at once. Family members help themselves, serving with a spoon and eating with right hands. There is less family gathering or ceremony of communal eating than in other cultures, but there is communal cooking and a strict hierarchy that determines one’s role and comportment at the table. Most meals are built around a cone-shaped pile of the long-grain, highly polished rice that Indonesians prefer. A meal may include a soup, salad, and another main dish. Whatever the meal, it is accompanied by at least one, and often several sambals, spice relishes that are mixed with the food. A light meal might consist of rice, some dried fish and a chile sambal. Indonesian cooking is rich with coconut milk. Beverages, sauces, soups, and even rice are prepared with it. Traditional spicing builds on a base of coriander, pepper, and garlic. Added to those are turmeric, cassia (the local bark that is quite close in flavor to cinnamon), bay leaf, star anise, ginger, tamarind, galangal, cardamom, lemon grass, scallion, shallots, peanuts, dried anchovies, and prawns. Even ghee finds its way into many recipes. Surprisingly, cloves and nutmeg, flavors at the very heart of the spice trade, play a marginal role, at best, in Indonesian cuisine. They are more commonly used in local medicine. A coal or kerosene fire provides the main heat source for cooking in Indonesia. However, since the weather is hot and fuel is expensive, many dishes are cooked communally, early in the day, and served at room temperature. A wok-like pan is the main cooking vessel for stir-frying, deep-frying and steaming. Foods are also slow-cooked at a low temperature in covered terra-cotta pots. Many satays and other meats are grilled directly over the fire. In the preparation of spice mixtures, Indonesians use a flat mortar stone — unlike the deep bowls that the Thai use to roll ingredients into a paste or powder. Originating in Malaysia and common in Indonesia and Singapore, beef rendang is beef and onion sauteed in a rich spice paste of ginger, garlic, chile, coriander and cumin; then simmered in coconut milk with lemon grass and tamarind water. In the 16th century, waves of Chinese laborers flooded Malaysia to work in tin mines. The Malaysian women they married and their daughters were called nonyas. The cooking they created combines Chinese methods and ingredients — such as dried mushrooms and fermented black beans — with the local cuisine. Nonya cooking is also distinguished by its fiery heat and its emphasis on tart flavors, created through using tamarinds, mangoes, and other sour fruits. A mixed vegetable and tofu salad with a spicy, sweet peanut dressing. This is a whole broiled fish with sauce and spicy marinades. During its preparation, the cook uses a crushed stalk of lemon grass as a brush to baste the fish with a mixture of coconut, chile, ginger, and lime. While much of the cooking in Southeast Asia assumes an unadorned steamed rice at the center of every table, the Indonesians like to flavor their rice. This is a festive, yellow savory cooked with onions, turmeric, cinnamon, coriander, and cumin. Sambal is the general term for an endless variety of relishes, many of which have chiles, either dried or fresh, at their bases. Sambals can be cooked or raw, preserved or fresh, bought commercially or homemade. They accompany almost every meal in Indonesia and in Malaysia as well, with ingredients changing to complement the main dishes. Depending on how it is made, a sambal can be used as a sauce, garnish, or side dish. Sambal ulek, made with a chile base and shrimp paste, sugar, and tomato, is a standard variety. Other typical sambals include spicy fried onions, bottled chutneys and pickles, toasted and spiced coconut, shredded cold omelets, thick fruity sauces, or fresh salsa-like vegetable mixes. It is said that satay, grilled meat on a skewer, originated in Indonesia. But, since satay is so widespread and so simple it would be impossible to declare a point of origin with absolute certainty. What is known is that satay is a favorite in Southeast Asian kitchens the world over. There is no standard recipe. Strips of meat are marinated then threaded onto wooden skewers and grilled over a fire. Satay can be an appetizer, with a sauce for dipping, or it can be an entire meal when served over rice. The meat can be marinated in a mixture of garlic, cumin, and soy sauce, or in an elaborate combination of coconut milk, chiles, ginger, fish sauce, palm sugar, sesame oil, shallots, lemon, and turmeric. Ground meat can also be used. One Indonesian dish blends herbs and spices into ground duck meat, then molds the mixture around lemon grass, which serves as the skewer. Thailand is a small country in Southeast Asia, sharing a peninsula with Burma, Cambodia, Laos, and Vietnam. Like all local and national cuisines, the food of Thailand reveals a great deal about the country — it is a palimpsest of its political history, its trade, and its geography. Thailand sits between the cultural and political powers of India and China, and its food is clearly influenced by both. Yet Thailand’s food, like her people, has maintained its own distinct identity. As with meals throughout Southeast Asia, a Thai meal has no courses. And like most cooking of the region, the Thai meal is built around rice. Southern Thai people eat long-grain rice, while the northerners favor short-grain or ‘sticky’ rice. Noodles, probably introduced from China, also play a role in Thai cooking. Of course, Americans usually don’t realize that rice is the main course, not the side dish — curries and other hot dishes are eaten by the Thai more as sauces than entrees, flavoring the cool rice. Meat is very expensive, and beef- or pork-based recipes often call for much less meat than would satisfy the average American carnivore. It is worth noting that the Thai eat with a spoon, fork and knife. In Southeast Asia, only the Vietnamese eat with chopsticks, so next time you’ll know why your waiter in the Thai restaurant coughs when you ask for chopsticks. Thai food is either stir-fried or steamed — primarily in a wok. Some foods are grilled, but, as in the rest of the region, a lack of fuel precludes baking. Chiles and other spices are ground into powder or paste with mortar and pestle or, for the convenience-oriented cook, with a coffee grinder. Thai curries are influenced by Indian cooking, especially that of southern India, where coconut milk is used to lessen the heat. There are three main types of Thai curries, green, red, and Mussaman, probably a bastardization of “Muslim,” from Indian Muslim influence. Originally based on a paste of garlic, peppercorn, and ginger, Thai curries now incorporate different types of chiles, among other flavors. Curry pastes, mixed with coconut milk, can make a sauce for any meat or vegetable, cooked together in the wok. Fish poached in a seasoned tamarind broth. A spiced chicken and coconut milk soup. Another popular Thai appetizer, mee krob is crispy deep-fried rice noodles topped with egg, and a sweet almost caramelized sauce — often it includes pork, tofu and/or chicken. Pad Thai, eaten in Thailand as a snack or lunch, is a ubiquitous entrée in Thai restaurants in the States. It is a dish of rice noodles tossed with bean sprouts, egg, and shrimp in a light sauce, garnished with peanuts, cilantro, and lime. Fish, curry paste, and other flavors are ground into a smooth paste that is then shaped into cakes and deep-fried. The result is a very spicy and chewy fish cake, which is a great appetizer. This is a salad made with strips of spicy marinated and grilled beef tossed with raw vegetables and served at room temperature. Vietnam is a long, skinny country stretching from Hanoi and the Red River in the north to Ho Chi Minh City and the fertile Mekong River Delta in the south. These ends are connected by a mountainous spine that runs along the South China Sea. On the west, Vietnam is bordered by Laos and Cambodia, and to the north, lies China. The food of the north, through stir-fries and noodle-based soups, shows the heavy influence of Chinese cooking. The mountainous middle section, with the former Imperial capitol, Hue, at its center, has an abundance of fresh produce. It was in Hue that royal chefs developed the more elaborate dishes of Vietnamese cuisine. The southern region is tropical, sustaining rice paddies, coconut groves, and many more spices than the north. As in the rest of Southeast Asia, there is an ancient layer of Indian cultural presence, most obviously evidenced in the religion of Buddhism (which, during the first millennium C.E., made its way along the Silk Road from India to East Asia). French colonization of Vietnam, which began in the 16th century and ended in the middle of the 20th century, also had a deep influence on Vietnamese cooking. The cuisine balances all these influences. One street vendor may noodle soup, pho bo, from his cart. The next vendor over might sell baguette smeared with one of the many ground pork concoctions known as pâtés. Both may be complemented by the ubiquitous native fish sauce (nuoc nam) or dipping sauce (nuoc cham — made from fish sauce, water, sugar, and lime juice and seasoned with chiles and garlic). As in many of the neighboring countries, a Vietnamese meal is rarely divided into courses. All the food is served at once and shared from common dishes. Meals are anchored by a starch, usually rice and sometimes noodles (especially in the north where grain is more prevalent than rice). The Vietnamese prefer long-grain rice to the glutinous short grain varieties preferred by northern Thai and Japanese palates. Most meals include a soup, a stir-fry, and another main dish. Often, a light salad with shrimp or beef and vegetables will accompany the meal. Like the Chinese, the Vietnamese eat from a bowl with chopsticks. Vietnamese cooking is generally not as rich or heavy as the coconut milk curries, of, say, Thailand or India. All that coastline means that fish and seafood are central to the diet. Other meats — pork, beef, and chicken — are also common, but in smaller quantities. Vegetables are often left raw, especially in the south, to act as a fresh contrast to the spicy cooked meat. The distinct flavors of Vietnamese food come primarily from: mint leaves, coriander, lemon grass, shrimp, fish sauces (nuoc nam and nuoc cham), star anise, ginger, black pepper, garlic, basil, rice vinegar, sugar, and green onions. Many flavorful marinades are made by some combination of these flavorings. Marinated meat or fish is quickly sautéed in the wok and served with an array of raw vegetables and herbs. All this may be eaten over rice or rolled in a rice-paper wrapper or lettuce leaf (or both), then dipped into a pungent sauce. These wonderfully refreshing delights are made by wrapping rice-paper around shrimp that has been “cooked” (like ceviche) in a lime-juice-based marinade and tossed with fresh herbs, such as mint, basil, and cilantro. The rolls are served uncooked. Razor-thin slices of raw beef and onion are dipped into a rich simmering beef broth. The cooked meat is then rolled into a rice paper bundle with fresh sprigs of basil, mint, cilantro, carrot, bean sprouts, cucumber, and a squeeze of lime. The whole is dipped into fish sauce (nuoc nam) or hot sauce (nuoc cham). Roasted (and sometimes deep-fried as well) chicken with a five-spice powder marinade. A soup built from a rich beef broth into which are stirred beef strips and noodles. This is common Vietnamese street food and comes with a variety of accompanying garnishes, such as chiles, fish sauce, hot sauce, and lime wedges.